Protocol describing the application of a flow cell system for growing and analyzing microbial biofilms for Confocal Laser Scanning Microscopy (CLSM). Weiss Nielsen, M., Sternberg, C., Molin, S., Regenberg, B. Pseudomonas aeruginosa and Saccharomyces cerevisiae Biofilm in Flow Cells. J. Vis. Exp. (47), e2383, doi:10.3791/2383 (2011). Many microbial cells have the ability to form sessile microbial communities defined as biofilms that have altered physiological and pathological properties compared to free living microorganisms. Biofilms in nature are often difficult to investigate and reside under poorly defined conditions1. Using a transparent substratum it is possible to device a system where simple biofilms can be examined in a non-destructive way in real-time: here we demonstrate the assembly and operation of a flow cell model system, for in vitro 3D studies of microbial biofilms generating high reproducibility under well-defined conditions2,3. The system consists of a flow cell that serves as growth chamber for the biofilm. The flow cell is supplied with nutrients and oxygen from a medium flask via a peristaltic pump and spent medium is collected in a waste container. This construction of the flow system allows a continuous supply of nutrients and administration of e.g. antibiotics with minimal disturbance of the cells grown in the flow chamber. Moreover, the flow conditions within the flow cell allow studies of biofilm exposed to shear stress. A bubble trapping device confines air bubbles from the tubing which otherwise could disrupt the biofilm structure in the flow cell. The flow cell system is compatible with Confocal Laser Scanning Microscopy (CLSM) and can thereby provide highly detailed 3D information about developing microbial biofilms. Cells in the biofilm can be labeled with fluorescent probes or proteins compatible with CLSM analysis. This enables online visualization and allows investigation of niches in the developing biofilm. Microbial interrelationship, investigation of antimicrobial agents or the expression of specific genes, are of the many experimental setups that can be investigated in the flow cell system. 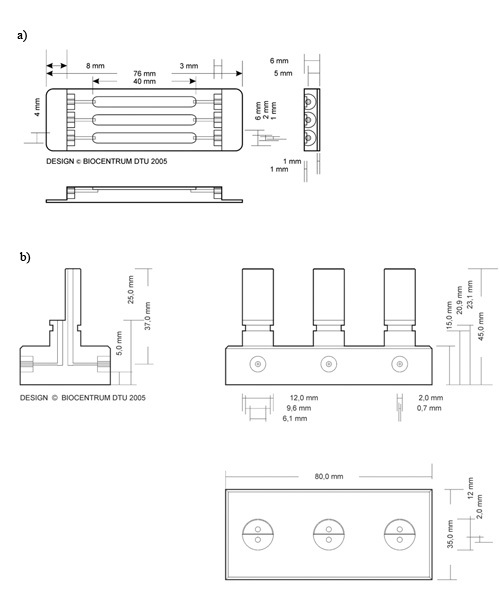 The assembled flow system includes: autoclavable tubing, bubble traps, medium/waste bottle and flow cells as shown in Figure 1. All these parts can be reused between experiments. Figure 1. The flow cell system setup (essential components of the setup). The flow cell system consists of several components: a medium bottle, a peristaltic pump, bubble traps, the flow cell, a waste bottle, and diverse sections of tubing interconnected by various connectors. Figure kindly provided by Rune Lyngklip. The flow cell (Figure 2a) is treated with thin lanes of silicone glue, using a syringe (Figure 3). Place a cover slip on top of the silicone lines (Figure 3). Glass cover slips are used as substratum for P. aeruginosa while PVC cover slips are applied for S. cerevisiae biofilm. Figure 3. Illustration of the silicone glue application lines for attachment of the glass substratum. The indicated cover glass is placed over the silicone glue to attach it to the flow cell. Turn the flow cell over and place it on a flat surface with the cover slip side down. Press gently on the back of the flow cell to push the cover slip onto the base of the flow cell. Turn the flow cell over and inspect for areas that are not sealed by the silicone. The handle (piston) part of a syringe can be used as a tool to gently press the glass and flow cell together. Place a feeding silicone tube (2 mm inner diameter) in a medium bottle and insert a straight connector at the other end. Cover connector and bottle with metal foil and autoclave the medium. Make sure that the end of the supply tube is fixed above the liquid level in the medium bottle or a siphon effect may empty the medium bottle when autoclaving. Assemble all tubing according to the outline in Figure 1. Use silicone tubing except for the part that goes through the peristaltic pump where Marprene tubing is applied. In order to connect the tube from the medium bottle to all individual flow chambers, split a tube into the required number of inlets applied in the experiment. Use T-connectors to make the desirable number of connection tubes from the feed tube to the Marprene tubes in the pump (see Figure 1, T-connector). It is generally a good idea to keep the same sequence order of tubes and flow cells throughout the system, to facilitate identification of components in case of faults in the system. Connect each individual feeding tube (2 mm in diameter) to Marprene tubes in the pump using straight connectors. Connect the Marprene tubing to a bubble trap (Figure 2b) via intermediate silicone tubing (1 mm in diameter). Make sure that the pump is connected to the inlet at the tallest part of the bubble trap. Connect the resulting outlet tube of the bubble traps to the flow cell inlet (1 mm in diameter), make sure that the length of these tubings allows the flow cell to be moved to the stage of the confocal microscope (typically 1 m). Place 5 mL syringes on top of the bubble traps. Close the tops with suitable caps. On the flow cell outlet connect a short, approximately 40 mm piece of (1 mm in diameter), tubing and use a "reducing" straight connector to attach a waste tube (2 mm in diameter) of needed length. Place waste tubes in the waste container. Importantly, the waste container must always be placed at the same level as the flow cells, never below flow-cell level. Also, make sure that the end of the waste tubing is fixed above the expected level of waste liquid to avoid flush-back due to a siphon effect when handling the flow cells. Remove bubble trap caps and place them in 70% ethanol to keep them sterile. Run at highest pump speed to fill the system with 0.5% (v/v) sodium hypochlorite in water. Place the bubble trap caps back on when the bubble traps are completely filled. Tap the flow cells to remove bubbles in the flow chamber. Take care not to damage the fragile cover glass. Allow the system to sterilize for 3-4 h at a flow rate of 3 mL/h/channel (0.2 mm/s linear flow rate). Wash the system 2-3 times to wash out all the hypochlorite. Fill and empty the system with sterile water. Bubble traps must be emptied completely between each wash. This can be done by pumping in air until bubble traps have been emptied. After emptying, remove caps from the bubble traps before refilling the system. Replace caps after the bubble traps have been completely filled with liquid. Repeat as required. Run sterile water through the system at a low flow rate (1-3 mL/h/channel) over night or proceed to the next step. Connect the medium bottle to the inlet and flush the system with medium over night at low flow rate (3 mL/h/channel) at the temperature where the experiment will be performed. Note: bubble traps must be emptied for water before the system is filled with medium. From an overnight culture make a dilution to a desired optical density (for P. aeruginosa e.g. 0.001 OD600nm and 0.1 OD600nm for S. cerevisiae). Use a 0.5 mL syringe with a 27G needle to load enough inoculum to fill the chamber. 250 μL is sufficient for the flow chambers having the dimensions specified in this work (Figure 2., 40 mm x 4 mm x 1 mm). Clamp off the silicone tubing leading to the flow cell to prevent back flow into the system. Sterilize the inoculation site on the silicone tubing by wiping it with 70% ethanol. Insert the needle into the silicone tube and introduce the tip into the inlet of the flow cell. Slowly inject the inoculum into the chamber (be careful not to inject air bubbles). Remove the needle and wipe the injection site with 70% ethanol followed by immediate sealing of the hole using silicone glue over the injection site. Turn over the flow cell and let the micro-organisms adhere to the substratum for 1 hour without flow through the flow cell. Turn the flow cell, start the medium pump (3 mL/h/channel) and take the clamp off the silicone tube. The system is placed for incubation, at 37°C in the case of P. aeruginosa and 30°C in the case of S. cerevisiae. Biofilm in the flow chambers can now be visualized by CLSM. Clamp of the silicone tubing leading to the flow cell. Sterilize inoculation site on the silicone tubing by wiping it with 70% ethanol. Use a 0.5 mL syringe with a 27G needle to load enough staining solution to fill the chamber. 250 μL is sufficient for the flow chambers used here. Insert the needle into the silicone tube and introduce the tip into the inlet of the flow cell. Slowly inject the staining solution into the chamber (be careful not to inject bubbles). Remove the needle and wipe the injection site with 70% ethanol followed by immediate sealing of the injection site. Leave the flow cell without flow for 15 minutes. We have demonstrated a flow cell system that represents a powerful tool in biofilm investigations. 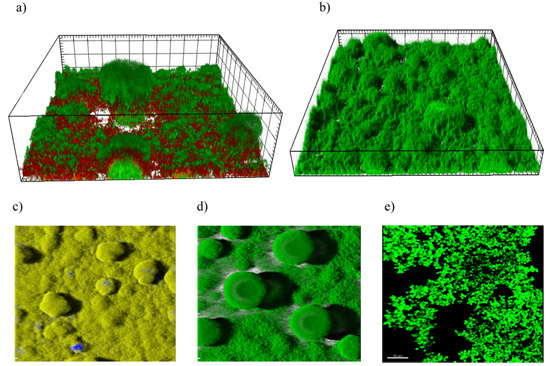 Combined with 3D imaging by confocal microscopy, the system has a range of advantages in comparison to other methods of analyzing microbial biofilms by means of more traditional microscopic techniques. This system allows 3D visualization of living microbial biofilm communities without disturbance of the community. Light microscopy will not provide detailed information about niches of the biofilm and while electron microscopy provides nanoscale resolution of the biofilm, it does not allow live cell imaging. Using the described flow channel system we have previously elucidated the spatial distribution of bacterial cells sensitive to several antibiotics5-8 (Figure 4a), distribution of extracellular compounds, e.g. DNA9-11 and, the distribution of motile and non-motile cells of the same species within a bacterial community4,6,9 (Figure 4c). We envision that the flow cell system can be used to study aspects of yeast biofilms. This may be the spatio temporal distribution of yeast biofilm in response to environmental factors such as fungicides as well as identification of genes involved in yeast biofilm development. Though yeast is not known to differentiate into motile and non-motile cells, other aspects of biofilm diversification may be studies such as the morphological shift from yeast to pseudohyphal cells and the shift from haploid to diploid cells. We have shown a system that comply with several microbial species and will work with several staining techniques. A variety of different staining probes and fluorescent proteins, such as GFP, enable specific niche investigations in the developing biofilm and is an efficient tool in analyzing the effect of antimicrobial agents or other environmental factors. The information that can be gained is very detailed (Figure 4) and features in the biofilm can be quantified with computer programs such as COMSTAT12,13. Overall, the most critical aspect of the protocol is the fact that it is a time-consuming process. It is also a limitation that the cells need to be able to grow on a non-fluorescent, transparent surface. Since the biofilm formed is analyzed using a confocal microscope, the depth that can be investigated is limited to a few hundred micrometres14.There are further technical limitations inherent in the design: the system is not suited for high throughput screening, as an experienced researcher can handle at most about 15 channels per experiment, which in turn can take several days to prepare. However, antibiotics or mutants that are considered relevant for biofilm studies can initially be mass screened with other methods such as crystal violet staining before the most interesting candidates are transferred to the flow cell system. The cover glass sheets are very thin and break easily, and care should be taken when handling the systems. In addition the tubing should be examined daily during the run of an experiment; as considerable "back-growth" in the inlet tubes just upstream of the flow cells can occur. Such contamination can be solved by removing several centimeters of silicone tube from the inlet side of the flow cells, using sterile technique. Figure 4. a) 4 day old PAO1 - GFP biofilm treated for 24h with Colistin and Propidium iodide for dead staining (red stain) b) 3D presentation of a three day old P. aeruginosa PAO1 (P. aeruginosa wild type) - GFP biofilm6 c) 3D picture presentation of a PAO1 - CFP pilA mutant (blue) with an PAO1 wild type YFP (yellow) d) 5 day old PAO1 - GFP biofilm presented as a 3D picture e) 26 h S. cerevisiae (PTR3 mutant in CEN.PK background) biofilm stained with Syto-915. Mix A10 and FB in a ratio of 1:10. Add carbon source to a desired concentration. Sternberg, C., Tolker-Nielsen, T. Growing and analyzing biofilms in flow cells. Curr Protoc Microbiol. Chapter 1, 2-2 (2006). Heydorn, A. Experimental reproducibility in flow-chamber biofilms. Microbiology. 146, 2409-2415 (2000). Pamp, S. J., Tolker-Nielsen, T. Multiple roles of biosurfactants in structural biofilm development by Pseudomonas aeruginosa. J Bacteriol. 189, 2531-2539 (2007). Haagensen, J. A. Differentiation and distribution of colistin- and sodium dodecyl sulfate-tolerant cells in Pseudomonas aeruginosa biofilms. J Bacteriol. 189, 28-37 (2007). Klausen, M., Aaes-Jorgensen, A., Molin, S., Tolker-Nielsen, T. Involvement of bacterial migration in the development of complex multicellular structures in Pseudomonas aeruginosa biofilms. Mol Microbiol. 50, 61-68 (2003). Pamp, S. J., Gjermansen, M., Johansen, H. K., Tolker-Nielsen, T. Tolerance to the antimicrobial peptide colistin in Pseudomonas aeruginosa biofilms is linked to metabolically active cells, and depends on the pmr and mexAB-oprM genes. Mol Microbiol. 68, 223-240 (2008). Pamp, S. J., Sternberg, C., Tolker-Nielsen, T. Insight into the microbial multicellular lifestyle via flow-cell technology and confocal microscopy. Cytometry Part A. 75A, 90-103 (2009). Barken, K. B. Roles of type IV pili, flagellum-mediated motility and extracellular DNA in the formation of mature multicellular structures in Pseudomonas aeruginosa biofilms. Environ Microbiol. 10, 2331-2343 (2008). Qin, Z. Role of autolysin-mediated DNA release in biofilm formation of Staphylococcus epidermidis. Microbiology. 153, 2083-2092 (2007). Allesen-Holm, M. A characterization of DNA release in Pseudomonas aeruginosa cultures and biofilms. Mol Microbiol. 59, 1114-1128 (2006). Heydorn, A. Quantification of biofilm structures by the novel computer program COMSTAT. Microbiology. 146, 2395-2407 (2000). COMSTAT2, a semi-automated java-based quantification program for the analysis of microbial biofilms [Internet]. Available from: http://www.comstat.dk/ (2010). Palmer, R. J., Haagensen, J. A., Neu, T. R., Sternberg, C. Handbook of Biological Confocal Microscopy. Palmer, J. B. Springer. 882-900 (2006). Haagensen, J. A., Regenberg, B., Sternberg, C. High Resolution Microbial Single Cell Analytics Advances in Biochemical Engineering and Biotechnology. Müller, S., Bley, T. Springer. (2010). Hi there. Good Job guys. Nice video. May I know where I can get the flow cells? Is it possible to work anaerobically whit that kind of experimental setup? Well the system is "possible" to use anaerobically, but there are of course a lot of difficulties. You will have the problem of keeping everything anaerobic. Oxygen gets in everywhere... I have been working with setups to try and make an addition that can keep it anaerobic however there are many issues that will make it almost impossible in the open space lab settings. In order to keep it totally anaerobic you would need to run it in an anaerobic chamber. This will of course make confocal pictures very difficult. If you would try to set up a system then you would have to exchange the silicone tubings with oxygen non-permeable tubings and deoxygenize the media after the bubbletraps and lead this through the oxygen non-permeable tubes to the flow cells. I will though say that it is very difficult as you need very special tubings made of eg. metal or glass. I have worked for quite some time with setups in order to get the system anaerobic and flexible tubings are never 100% impermeable, so this will make everything really hard. But with the most non-permeable viton tubings you will be able to lower the oxygen levels significantly. There are sites where oxygen can get in to the system; outlet from flow cell and through the silicone the glues on the glass. So there are many factor you would have to consider and shield of. I guess you could set it up in the anaerobic box, fixate your biofilm in the chamber and clamp of your tubings and take them analysis at the microscope. It depends on your desired setup etc. You are welcome to write a mail or call for discussion on possibilities. thanks for the nice vedio. may I ask a question dabout staining? how to stain with the syto 9 and the PI at the same time?mix them before the injection,or inject them separately? and use what software to analyse the biofilm? We mix PI and Syto9 before staining and use the "Imaris" software. Combine equal volumes of the two ?and what's the volumes? Yes, in the case of S. cerevisiae biofilm staining, you can use equal volumes of PI and SYTO9 each 1:1000 diluted. I have sometimes used twice the ammount of SYTO 9, because it gives better staining. But the optimal solution would be to express GFP, Cherry, YFP or CFP in the biofilm forming cells. we use it to stain the staphylococcus aureus biofilm. Hi there, great video! Can you tell me if it is possible to use just any silicone paste or do you specially suggest the one you used? Thanks! Hi Barbara. Well you can not use any kind of silicone as there are some types that have anti fungal/bacterial properties. So be aware and look at the content of it. The one we use is very durable and biocompatible. But there are other ones that can be used but I don't how they are according to biocompatibility and adhesive properties. But the one we use have been used for many years so I will of course recommend that one. Thank you for this great video! It has been very helpful to me in setting up and running flow cells. However, I am facing when I re-use the flow cells. Currently, I autoclave the used flow cells at 1²1 DegC for ²0 min and soak them in antibacterial soap solution for ²4 hours which helps to soften the glue and so the cover slip can be removed easily, without causing any damage to the channels in the flow cell. I then wash the flow cells thoroughly and glue a new coverslip and sterilize it. But when I use it I am not getting any biofilm growth in the flow cell even after 3 days! The bacteria are growing very well in the inlet and the outlet tubing, but not in the flow cell. Just so that you know, the silicone sealant that I use is also a commonly used glue for flow cells. Please advice if my method of re-using flow cells is not right. Thank you! I am glad you have found it useful to setting up you experiments. Well I can only see that the problem lies in the use of the soap. We normally soak the flow cells in ethanol in order for the glue to be more easily removed from the flow cell. If you have growth in the inlet and outlet the problem lies in the chamber. So if you know that the silicone is suitable for bacterial growth, then I can only see the soap as the problem. I would advise you to run hypochlorite through it to sterilize after running it (killing of your bacteria in the system) and then trying to fill it with ethanol and do it that way! I can not see other things that could do this. So hope that will help you otherwise let me know and we will try and go through it. But take out the soap and try the other way. Where can get suitable caps for the syringes? Can I made them myself? Let me know if you need more advise. It is so helpful more than papers. It looks like the web page is not working recently. It seems that Susanne Koefoed is busy now. I have not received a response email from her. Could you tell me alternative way to purchase your flow cells and bubble traps? Here is an updated link for the info on how to get the flow chambers and bubble traps. The link may change - in that case I will make a new post here. When i do analysis of the result in the CLSM, which lens i should use x40,x60? The figures a and d, I didn't manage to display my results this way, could you please give me guidance? I suppose to use volume option or surface (I work on the Imaris software)?